Good news for all our chrome Stromberg 97 customers. The full TwoStep linkage range is now available with chromed die-cast levers and polished stainless steel. 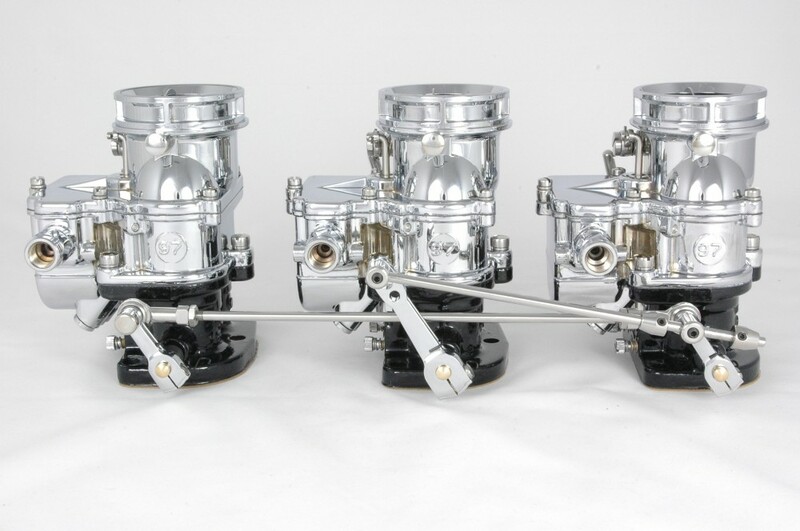 Designed specifically for use with multiple Stromberg 97 carburetors, the TwoStep range of direct and progressive kits covers all of the commonly available 2×2 and 3×2 intake manifolds – principally for flathead Ford, small block Chevy and Ford, plus various other vintage OHV V8 engines. Chrome linkages for 4×2 and 6×2 applications are also available to order. The new chrome range perfectly complements our popular chrome Stromberg 97 carburetor (9510A-CHR), and chrome fuel delivery parts. With our show chrome models now accounting for a significant percentage of carburetor sales, customers were naturally asking about matching linkages. So we’re particularly pleased that we can offer real show quality chrome and polished stainless pieces….and at very competitive prices. Direct linkages available with swivels or rod ends – opposite threaded for easy adjustment. Versatile progressive linkages allow you to choose when the secondary carburetors open. Every kit includes two Stromberg ‘Snapback’TM throttle return springs. Wrapped around the linkage end of the throttle shaft, these chemically blacked, stainless steel torsion springs snap the carburetors shut, yet virtually disappear from view. Every Stromberg TwoStep linkage kit comes with full instructions, and further help with selection, installation and tuning is available at the Stromberg Tech Center at www.stromberg-97.com. You’ll find all of our linkages, regular and chrome, on the Stromberg website. Click the link to check them out. This entry was posted in Stromberg product news and tagged 2x2, 3x2, 4x2, 6x2, 97, chrome, linkage, TwoStep by Clive. Bookmark the permalink. on center i would like to use your 9243pro-chr linkage & your 1 pic s s fuel line . Summit racing does not show eather one . can you help me ? Hi Terry We emailed you on this one. Thanks. Summit are now about to stock our chrome range too, which is great news for all of us!